As autotrophic prokaryotes, cyanobacteria are ideal chassis organisms for sustainable production of various useful compounds. The newly characterized cyanobacterium Synechococcus elongatus UTEX 2973 is a promising candidate for serving as a microbial cell factory because of its unusually rapid growth rate. Here, we seek to develop a genetic toolkit that enables extensive genomic engineering of Synechococcus 2973 by implementing a CRISPR/Cas9 editing system. We targeted the nblA gene because of its important role in biological response to nitrogen deprivation conditions. First, we determined that the Streptococcus pyogenes Cas9 enzyme is toxic in cyanobacteria, and conjugational transfer of stable, replicating constructs containing the cas9 gene resulted in lethality. However, after switching to a vector that permitted transient expression of the cas9 gene, we achieved markerless editing in 100 % of cyanobacterial exconjugants after the first patch. Moreover, we could readily cure the organisms of antibiotic resistance, resulting in a markerless deletion strain. High expression levels of the Cas9 protein in Synechococcus 2973 appear to be toxic and result in cell death. However, introduction of a CRISPR/Cas9 genome editing system on a plasmid backbone that leads to transient cas9 expression allowed for efficient markerless genome editing in a wild type genetic background. Photosynthetic microbes are of considerable interest for applications in carbon sequestration, photosynthetic production of fuels, and biosynthesis of other valuable chemicals such as pharmaceuticals [1, 2]. The advantage of using cyanobacteria as biofactories is that they grow on CO2 and sunlight alone; this reduces greenhouse gas emissions and decreases dependence on petroleum-based products. Furthermore, cyanobacteria are the evolutionary ancestors of plastids and serve as model organisms for the study of the photosynthetic apparatus. Commonly studied cyanobacteria such as Synechococcus elongatus PCC 7942, Synechococcus sp. PCC 7002, and Synechocystis sp. PCC 6803 have been genetically engineered to generate a variety of useful products including ethylene , hydrogen , free fatty acids , ethanol , and isoprene . Additionally, genetic manipulation has been used to rewire central metabolism and redirect carbon sequestration into end products by deleting competing pathways [8, 9]. A newly identified cyanobacterial strain that has the potential to become a versatile chassis for metabolic engineering and biological discovery is Synechococcus 2973. With a 1.9-h doubling time, Synechococcus 2973 has a growth rate akin to that of Saccharomyces cerevisiae . The genome sequence of Synechococcus 2973 is 99.8 % identical to that of the model organism Synechococcus 7942, which has a slower doubling time of 4.9 h. However, the development of Synechococcus 2973 as a model organism has been hindered by the lack of an efficient genetic modification system. Synechococcus 7942 is naturally competent, whereas Synechococcus 2973 does not have the capacity to take up naked DNA. Although Synechococcus 2973 has proven to be capable of conjugative transfer of DNA, the rate at which subsequent genome modification occurs is less than that found in Synechococcus 7942 and other model species of cyanobacteria. The current genetic manipulation system for Synechococcus species is well developed, however, it often requires a significant amount of time to generate the desired mutant strains. The strategy typically used for engineering a deletion mutant in Synechococcus relies on double homologous recombination between a suicide vector and host chromosome, and involves replacing the gene of interest with a selective marker . Additional genetic alterations are made by integrating other antibiotic resistance markers. This restricts pathway engineering because there are a limited number of antibiotic cassettes available. Moreover, cyanobacteria maintain multiple copies of their chromosome and numerous rounds of segregation are often necessary to obtain a completely segregated mutant . Although the genome copy number for Synechococcus 2973 is yet to be determined, Synechococcus 7942 cells contain three to four genome copies. As a result, the process of segregation can take weeks of restreaking on selective media to obtain a segregated strain. Alternatively, markerless deletion strategies have been developed that rely on a dominant streptomycin-sensitive rps12 mutation . A major drawback of this system is that it requires working in a genetic background that contains the appropriate rps12 mutation. Additionally, this strategy is time-consuming because it relies on two subsequent rounds of transformation. Recently, CRISPR/Cas9 systems have emerged as versatile editing platforms for engineering markerless mutations in a wide variety of organisms [14–16]. However, a CRISPR/Cas9 system for markerless genome editing in cyanobacteria has not yet been developed. In nature, the CRISPR (clustered regularly interspaced short palindromic repeats)/Cas9 (CRISPR associated protein 9) system provides adaptive immunity in bacteria against invading viruses or plasmids by cleaving and degrading the exogenous DNA . Upon infection, invader sequences are incorporated as spacers between a series of palindromic repeats in a CRISPR array [18, 19]. The CRISPR array transcripts are then processed into two RNA components: the crRNA and tracrRNA . These are used to guide the Cas9 nuclease to the complementary target sequence, where Cas9 creates a double stranded break . The CRISPR system can be engineered for genome editing by reprogramming the spacer sequences to be complementary to the genetic target . The directed break is subsequently repaired by double homologous recombination, during which a homologous sequence serves as a repair template [22, 23]. By providing a repair template containing the desired change to the target sequence, specific genomic mutations or deletions may be made at the cut site. Although there are not yet any instances of application of a CRISPR/Cas9 genome editing system in cyanobacteria, studies have been performed that aim to characterize the native cyanobacterial CRISPR system [24, 25]. Little work has been performed to characterize the CRISPR/Cas system in Synechococcus elongatus. However, computational analysis of various cyanobacterial genomes has predicted the presence of various combinations of IA, IB, IIA, IIB, IIC, IID, IIE, IIF, IIG, and III CRISPR/Cas subtypes [24, 26]. Furthermore, recent studies have been aimed at developing a CRISPRi system for gene repression in cyanobacteria . In the current study, we repurposed a CRISPR/Cas9 system, originally developed for genome editing in Streptomyces lividans, for use in the fast-growing cyanobacterium Synechococcus 2973 . Using derivatives of the pCRISPomyces plasmids, we introduced a markerless deletion into Synechococcus 2973 and determined that the mutated strain was completely segregated in the first patch. In addition to serving as metabolic chassis, cyanobacteria are ideal systems for better understanding photosynthetic processes . Thus, as a proof of concept for the ability to generate a markerless deletion mutant with the CRISPR/Cas9 system, we chose to target the nblA gene, which has an important function in cellular response to nutrient deprivation conditions. Cyanobacteria have large antenna protein complexes that harvest light for photosynthesis . One intriguing feature of these prokaryotes is their ability to modulate the size and structure of these antenna complexes based on nutrient availability . NblA is involved in the degradation of phycobilisomes, one of the primary antenna protein complexes associated with photosystem II . By targeting nblA for deletion, we demonstrate that the CRISPR/Cas9 system can be used to better characterize the function of biologically important genes. This improved method of genome editing is expected to facilitate rapid and efficient genetic engineering of Synechococcus strains. Moreover, the number of edits that can be made using CRISPR/Cas9 editing is not limited by choice of antibiotic cassettes and will enable extensive modification of host genomes for the production of useful bioproducts. We initially attempted to assemble a complete CRISPR system using the medium copy number plasmid backbone pVZ321, an RSF1010 based backbone, which is stably maintained in cyanobacteria [33, 34]. We selected the nblA gene, an essential element for phycobilisome degradation in Synechococcus 2973, as a target for deletion . These mutants have a phenotype that can be detected visually. While the wild type Synechococcus 2973 strain exhibits yellow bleaching that is characteristic of phycobilisome degradation when grown in media lacking nitrate, the ∆nblA strain has an obvious non-bleaching phenotype and remains green under these conditions. Furthermore, bleaching is only apparent when all copies of nblA have been deleted, allowing it to serve a visual marker for segregation. The construct pVZ321 was engineered to contain S. pyogenes cas9 (derived from pCRISPomyces-2), a synthetic guide RNA (sgRNA) designed to target nblA, and an editing template to introduce the nblA deletion. After multiple conjugation attempts with this construct, we were unable to recover exconjugants. However, the same backbone lacking the CRISPR/Cas9 system yielded ~250 colonies in each of two conjugation attempts. To assay for cas9 toxicity, we proceeded by engineering the pVZ321 backbone to contain only cas9. Once again we were unable to recover colonies from conjugation with the cas9 containing plasmid. In an effort to circumnavigate toxicity from cas9, we reduced expression to basal level by removing 500 base pairs of the upstream sequence, including the ribosome binding site and promoter. Conjugation of the resulting plasmid into Synechococcus 2973 yielded less than five exconjugants in each of two attempts, while the vector without cas9 yielded ~250 exconjugants. Experiencing little success with the pVZ321 backbone, we switched to a vector that would theoretically allow for transient expression of cas9: the pCRISPomyces-2 construct from the Zhao lab. Replication of this vector is dependent on a Streptomyces ghanaensis pSG5 origin of replication, which is not functional at temperatures above 34 °C . In our study, all conjugation experiments were performed 38 °C (the optimal temperature for Synechococcus 2973), which is above the permissive replication temperature in S. ghanaensis. This allows for initial transient expression of cas9 directly after its conjugation into Synechococcus 2973, but prevents prolonged expression of the toxic gene because the plasmid presumably does not replicate after it is transformed into the cyanobacteria. We modified the pCRISPomyces-2 vector to target nblA in Synechococcus 2973 by inserting an sgRNA that targets nblA and an editing template designed to introduce the nblA deletion (Fig. 1a). We employed a deletion strategy that would not rely on the integration of a selective marker into the genome as a proof-of-concept for making a markerless genome modification. Triparental mating was used to introduce the ∆nblA CRISPR construct into Synechococcus 2973. Antibiotic selection was used to force temporary persistence of the plasmid at a basal level. A typical conjugation yielded 21 colonies and a subset of these exconjugants was assayed for bleaching in media lacking nitrate (Fig. 2). Additionally, PCR and Sanger sequencing were used to confirm that the non-bleaching phenotype was the result of nblA deletion and not a single recombination event in colonies that failed to bleach under nitrogen deprivation conditions. To determine the proportion of editing that is dependent on Cas9 cleavage, we built a secondary construct in which the cas9 gene was deleted (Fig. 1b). Triparental mating was used to introduce the -cas9 construct into Synechococcus 2973 to compare differential exconjugant yields. We used PCR to assess whether exconjugants were edited and segregated (Table 1; Fig. 3). The presence of antibiotic resistant exconjugants suggested that the editing plasmid was being maintained, even under conditions that were supposedly non-permissive for replication. We confirmed this by performing PCR assays to test for the presence of cas9 in exconjugants (Fig. 4). In order to determine whether exconjugants could be cured of cas9 and the apramycin-resistance marker, colonies were patched onto media lacking antibiotic selection. The loss of the ability to grow on antibiotic-containing media occurred by patch ten (Fig. 5). Furthermore, after the organisms lost their capacity to grow on selective medium, we used PCR to assay for the presence of cas9, and found that we were unable to amplify the gene in patch ten (Fig. 4). The inability to produce a significant number of exconjugants with constructs containing cas9 suggests that the gene is toxic in Synechococcus 2973 when it is introduced on a medium copy number plasmid. The fact that only five colonies were yielded from conjugation with a construct in which the cas9 RBS was removed (compared to the ~250 colonies with the construct lacking cas9) suggests that these exconjugants are “escapees” with respect to cas9 toxicity. Furthermore, we conclude that the cas9 gene cannot be stably maintained in Synechococcus at a medium copy number level. Although the reason behind Cas9 toxicity is currently unclear, one possibility is that S. pyogenes Cas9 has off-target effects in cyanobacterial cells. The enzyme may be cleaving genomic DNA in regions other than those targeted by the synthetic sgRNA, and that the cell is unable to repair these breaks, thus resulting in lethality. After switching to a plasmid backbone that facilitated transient expression of cas9 (pCRISPomyces-2), we found that we were able to engineer the intended nblA deletion strain. All of the exconjugants failed to bleach under nitrogen deprivation conditions, suggesting that nblA had been edited. Since the organism cannot retain any functional copies of nblA to exhibit the non-bleaching phenotype, this also suggests that segregation had occurred and only the mutated genome copy remained. The fact that we were able to produce antibiotic-resistant exconjugants shows that permissive temperature of replication differs between the Synechococcus 2973 system and the Streptomyces lividans system. We believe that the pCRISPomyces-2 backbone replicates at a basal level at 38 °C in Synechococcus 2973. PCR assays show that cas9 was present in early patches, but not in later patches (Fig. 4), making it transient in nature. Although the total number of exconjugants yielded with a construct lacking cas9 was higher, which may be attributed to the smaller size of the construct, the rate of editing and segregation in the absence of cas9 was reduced. When using a construct that contains cas9, exconjugants are edited and segregated 100 % of the time in the first patch. However, constructs lacking cas9 are only edited and segregated 30 % of the time. This suggests that Cas9-mediated cleavage accounted for roughly 70 % of editing in the engineered Synechococcus 2973 cells. Many bacterial CRISPR/Cas9 systems rely on the generation of a strain that has S. pyogenes cas9 engineered into the genome of the organism undergoing editing. However, with this system, edits are made in a genetic background that is distinct from the wild type organism. The benefit of introducing the CRISPR/Cas9 editing machinery on a plasmid is that after editing is completed, the foreign construct may be cured from the organism, leaving behind a truly “markerless” modification in a wild type background. Furthermore, the fact that cas9 appears to be toxic in cyanobacteria suggests that engineering cas9 into the genome is a suboptimal approach for this class of organisms. The fact that the exconjugants lost the ability to grow on selective media after subsequent rounds of patching suggests that the organisms were cured of the plasmid containing the CRISPR/Cas9 machinery. Furthermore, the inability to amplify the antibiotic resistance gene after passaging on nonselective medium provides further confirmation that the organisms were cured of the plasmid. Thus, we were able to take advantage of one of the most valuable aspects of CRISPR/Cas9 genome editing: ability to generate markerless genetic modifications in a wild type background. This is the first report of the use of a CRISPR/Cas9 genome editing system in a cyanobacterial strain. Although cas9 has been used with great success to make genome modifications in other organisms, we found that in Synechococcus 2973, cas9 expression must occur in a transient manner to achieve successful editing. The fact that editing success depends on transient cas9 expression in one cyanobacterial strain suggests that cas9 toxicity may be the reason the application of CRISPR/Cas9 genome editing in cyanobacteria has lagged behind that of other organisms. The CRISPR/Cas9 genome editing method described here will no doubt advance diverse scientific investigation in cyanobacteria. All cloning was performed in the Escherichia coli strains HB101 and XL1-Blue. Cells were grown at 37 °C in LB media in liquid or on agar plates supplemented with 50 μg/mL apramycin or 50 μg/mL kanamycin as required. Synechococcus 2973 and Synechococcus 7942 cells were grown in BG11 medium at 38 °C under 80 μE m−2s−1 of continuous white light in two manners: on agar plates, supplemented with 20–50 μg/mL apramycin as needed or shaking in 125 mL Erlenmeyer flasks. Plasmids used for conjugation were constructed as described in the Additional file 1 addendum. Tri-parental mating was used to introduce the nblA-targeting pCRISPomyces-2 into wild type Synechococcus 2973, with pRL443 as the conjugal plasmid and pRL623 as the helper plasmid . The HB101 strain, which already carried pRL623, was transformed with nblA-targeting pCRISPomyces-2 and served as the cargo-carrying strain in the tri-parental mating. Escherichia coli cultures were inoculated approximately 17 h prior to use and grown to OD600 = 0.6. Cyanobacterial strains were also inoculated approximately 17 h prior to use to OD730 = 0.25, and grown to OD730 = 0.4, as measured on a μQuant Bio-Tek plate reader. All bacterial cultures were washed prior to use in conjugation with either distilled water for E. coli or BG11 for cyanobacteria. 100 μL of the cargo and conjugal E. coli lines were combined with cyanobacteria cells from 1 mL of liquid culture for each conjugation reaction and resuspended in a total volume of 300 μL. Subsequently, 100 μL of the conjugation reaction was plated on BG11 agar plates containing HATF transfer membranes (Millipore). In conjugation with pVZ321-based plasmids, filters were incubated on nonselective media for 24 h before transferring the membranes to BG11 agar plates supplemented with 50 μg/mL kanamycin. For conjugation with pCRISPomyces-2- based plasmids, after 4 days, the membranes were moved to BG11 agar plates containing 20 μg/mL apramycin, and after 3 more days these membranes were transferred to BG11 agar plates containing 50 μg/mL apramycin. Exconjugants were transferred from patches to liquid cultures and allowed to grow to a suitable volume and density to allow for visualization of bleaching. Cultures were washed three times with BG11 lacking nitrate, resuspended in the same media, and assessed 24 h later for differential coloration in comparison to a wild-type sample. DreamTaq (Thermo Fisher Scientific) was used for all deletion confirmation reactions in addition to all of the reactions checking for single recombination events. The set composed of PrimerA/PrimerB was used to check for deletion of nblA in the chromosome, the PrimerA/PrimerC set was used to check for single recombinants in one orientation, and the PrimerD/PrimerE set was used to check for single recombinants in the other possible orientation (see Fig. 3). Exconjugants were initially selected for on BG11 agar plates supplemented with 20 μg/mL apramycin. The first patch was carried out on BG11 agar plates supplemented with 20 μg/mL apramycin. 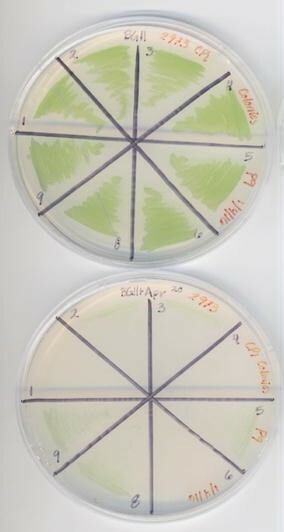 Subsequent patches were performed on BG11 agar plates. Colonies were assayed for curing by the loss of ability to grow on apramycin-containing media after each round of patching. After colonies appeared to be cured, further testing was done via colony PCR, to ensure that a portion of the pCRISPomyces-2 backbone could not be amplified from later patches as opposed to amplification in earlier patches (Cas9ChkF/Cas9ChkR). KEW and REC designed the pCRISPomyces-2 based plasmids, and KEW conducted the experiments with these plasmids. Designs and experiments with the pVZ321 based plasmids were performed by JU. HBP and HZ participated in the development of the initial concept for the study and mentorship. The manuscript was composed by KEW, JU and HBP. All authors read and approved the final manuscript. We thank all members of the Pakrasi lab for collegial discussions. Funding to support this work was provided by the Office of Science (BER), U. S. Department of Energy to HBP and JW, and by the National Institutes of Health (GM077596) to HZ and REC. KEW has been partially supported by a William H. Danforth Plant Sciences Fellowship at Washington University. 12934_2016_514_MOESM1_ESM.docx Additional file 1. The supporting information for this document includes additional details on vector construction, the sequences for all of the primers used in this study, the annealing temperatures for all of the primer sets used for amplification in this study, and a list of the constructs used in this study with descriptions of their molecular and genetic contents.